Achievers celebrated their 3rd anniversary this Saturday, 3rd May, themed Investing in Girls – A catalyst for changing the world. Present were the Imams of Abu Ubaida and several mosques in the community, Jazi Foundation and friends and Tech Needs Girls. 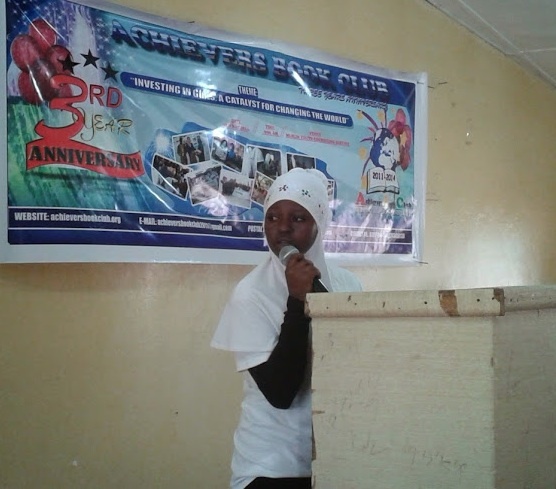 The girls entertained through poetry recitals, quranic recitations and drama. Amina, co-founder, also shared accomplishments in the last three years. This included not only raising funds to support girls in school, but monitoring and providing mentorship to these girls. With support from the community young Amina says they hope to reach even more girls in the coming years. Our utmost appreciation goes to Amadu (our director and co-founder) for organizing this great event. This entry was posted in Uncategorized and tagged 3 years, Amina, anniversary, celebration, Imams, Jazi, tech needs girls. Bookmark the permalink.